As you may have noticed, this week all of our blog posts have had a central theme: Harry Potter. And as each post was unveiled, I felt the challenge to somehow frame my post around the Wizarding World. Well, challenge accepted. As I was wracking my brain trying to figure out exactly how I could relate my job at Gulfshore Playhouse to Harry Potter, I came up with two options, so I’ll spend a little bit of time talking about each of them. The first is that Harry finds a family in the friends and teachers he meets at Hogwarts (I’m keeping the Harry Potter synopsis fairly short, but if you want more detail I’d be happy to provide it). And the theatre world is very similar. Most of our staff does not hail from Naples, Florida, or even Florida in general. We are a group of people who all moved here specifically to take jobs working for this small non-profit regional theatre and as a result, coworkers become almost like family. There are days where we spend all day laughing and joking while we work, or we all go out together after the evening’s show. And there are days that I just want to sit in my little corner and get my work done, without all of the excess activities that happen in an office of 8. Harry finds a family of misfits the first time he steps through Hogwarts’ doors. And the similarities between that and a theatre company are quite staggering when you sit down and think about it. 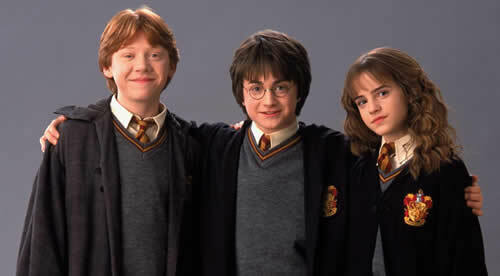 The second is the pure enormity that the Harry Potter brand has grown to over the last 15 years. More than 450 million copies of the books have been sold worldwide, there are movies, video games, interactive experience websites, fan fictions, and I’m sure loads more that I’ve never even heard of. The Harry Potter brand is an amazing thing to explore, and learn from. It all started from an idea, and grew into an empire. Now, you may be thinking: “Wait, how on earth can this relate to Gulfshore Playhouse? !” Well, let me tell you! While a regional theatre company may not have the capability to grow to the worldwide recognition of Harry Potter, we do have a distinctive brand. For the first time ever in our history, we are using advertising for pure branding purposes (like the ad shown in this post! ): to get the Gulfshore Playhouse name out in front of the community. In my job, I am working towards reaching audiences to pique their interest in our product; just from our name, a tagline, and photos from our productions. 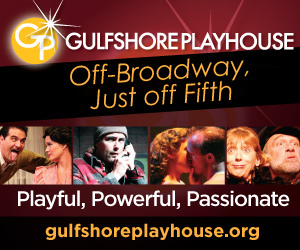 We have 6 shows this season, and while I definitely want to intrigue our patrons to come and see each of them, I want the Gulfshore Playhouse brand to be recognizable in Southwest Florida. I want everyone who hears our name to know exactly who we are and why we are important, just like the words ‘Harry Potter’ are so recognizable around the world. Challenge Accepted.